If there were a simple technique that could help reduce stress, anxiety and other negative emotions in minutes, would you want to know about it? My guess is that your answer is YES! This is exactly why I’m so excited to share this simple technique with you today! Like many of us in our busy, modern world, I’ve come to know stress and anxiety as the daily norm; and a couple of years ago, this daily stress caught up with me. I found myself feeling constantly fatigued, irritated and overwhelmed, and I finally told myself I had had enough. So, I started making self-care an intense priority and doing more research on ways to ease stress. I finally gave it a go and was blown away by the results. What Is Emotional Freedom Technique (EFT), or Tapping? This was what led me to discover a practice known as Emotional Freedom Technique (EFT), or tapping. 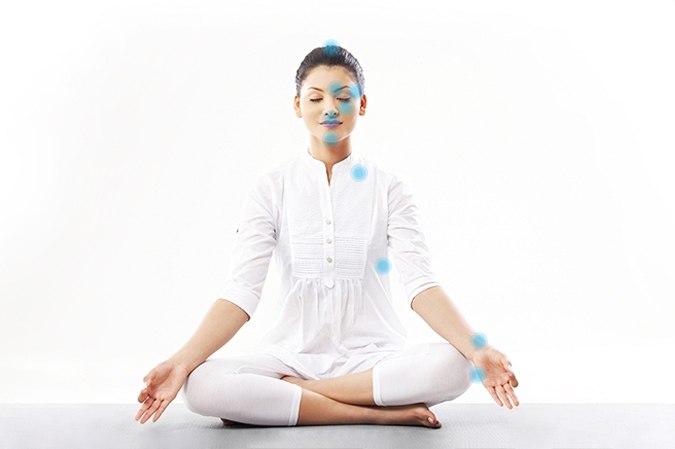 EFT involves tapping on the pressure points of the body and is a combination of acupuncture with psychological tactics. I had heard about EFT for a while, but as silly as this sounds, it seemed too simple to be effective, so I avoided trying it for a really long time. Over the past four years, I’ve continued using EFT to reduce stress and anxiety, along with alleviating physical pain. Since there are so many of us who struggle with stress, negative emotions and physical pain, I wanted to share this with you in hopes that it can help your life too! EFT, or tapping, involves using your fingers to literally tap on each of the body’s twelve meridian points about 5–7 times while stating the problem or feeling that you are experiencing. This practice helps to restore your body and energy to a balanced state. Today marks the start of the 9th Annual Tapping World Summit, organized by New York Times best-selling author Nick Ortner. Over the past eight years, this online event has been attended by over 2 million people. I can also tell you that for the past few years it has honestly changed my life. Check out this free video where Nick Ortner will walk you through the technique of tapping and help you to ease stress and anxiety in a matter of minutes. You can also sign up to get FREE access to the online summit with videos by twenty of the world’s leading tapping experts! One thing I can promise you is that after you watch this video and go through this simple process with Nick you will feel better. It’s as simple as that!